Interesting evening , one that occurred Tuesday, June 11 at the Jumeirah Grand Hotel Via Veneto in Rome. An international night , I would say , given the nationality of the guests, the location and cigars , strictly Cuban . For me it was a historic event. Yes, you read that right. Present were the two people that I have hijacked the amazing world of Habanos , Armando and Freddy . Years ago, I worked for The Box Music Television YOU Control , American broadcaster . It was the most beautiful experience of my life full of satisfaction . I was the manager of the finance sector in Italy and more I enjoyed creating events in collaboration of the staff of television. One of my colleagues was Frederick Hawkins , an American man, strictly speaking Roman dialect. He had a great passion: the cigars ! During breaks , reading glossy magazines who watched with deep admiration. Curious like a monkey, I sat behind him peeking its magazines. They were cigar magazines. To be more precise , Cigar Aficionado . I slowly walked over to the unknown world. I went to a tobacco shop in Via Nizza to buy some cigars . Being completely in the dark , the choice fell on the package. Used to buy the cigars according to the packaging . I remember that I smoked cigars from the blue tube in aluminum. They were J. Cortes . I liked the gesture of the cigar. The great love , however, was born one night in Ostia, at the home of another colleague , Armando . Which he invited all the staff of The Box. Everyone brought something . I presented myself with a couple of bottles of Chianti . Frederick , with a box of 3 Montecristo n. 4 . We sat on the patio that overlooked the seafront in Ostia. Freddy , Armando and I lit the puros. At that moment I became a Cuban Cigar Aficionado . A little later , our paths separated. The Box closed its doors . Armando went to work for another broadcast . Freddy returned to New York . And I walked in the staff accountant of a famous U.S. law firm . Tuesday 11 June was a reunion . The beasts in us dormant site , have not been slow to wake up and get out . After a few minutes had taken the usual teasing , as if no time had passed . We smoked the canonazos , combining them with a single malt connoisseurs, a Highland Park 18 YO . Freddy told us about the latest news from New York making us notice the difference in social status between the mayor of Rome ( old and new that is) and that of the U.S. city . Kastriot however, slightly aloof , he fully enjoyed the smoked Cuban . I am sure that his thoughts will be flown to Isla Grande and the fantastic atmosphere that has lived on his recent trip habanero . Antimo conversed as usual , pulling out his whole personality . 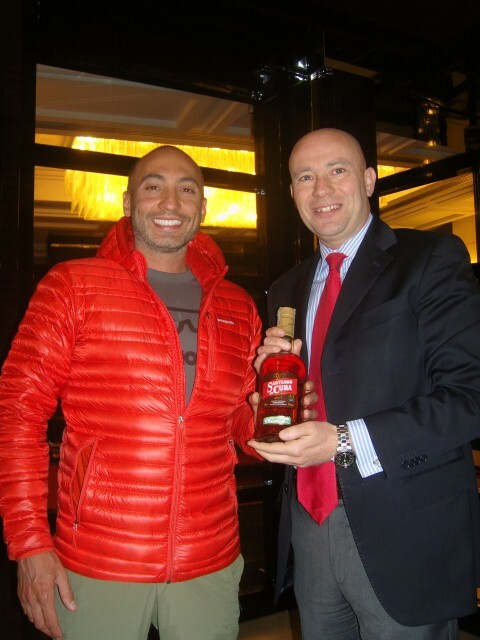 And Daniel won the bottle of Ron Santiago de Cuba , as he played almost by heart my article on the Punch brand . I sat in front of Armando and Freddy , looking pleasant conversation . For an hour and a half I went back fifteen years ago. I thank all the participants in the evening , it was really enjoyable. A special greeting to all the staff of Jumeirah Grand Hotel Via Veneto that has elected favorite table and spoils us with its delicious chocolate . Los Puros del Martes will be back soon . And, for the moment, so we’re fine. Serata interessante, quella avvenuta martedi 11 giugno presso il Jumeirah Grand Hotel Via Veneto di Roma. Una serata internazionale direi, considerata la nazionalità degli ospiti, la location ed i sigari, rigorosamente cubani. Per me è stato un evento storico. Si, avete letto bene. Erano presenti le due persone che mi hanno dirottato nel fantastico mondo degli Habanos, Armando e Freddy. Anni fa, lavoravo per The Box, un’emittente televisiva americana. Fu l’esperienza professionale più bella e piena di soddisfazioni della mia vita. Ero il finance manager del settore Italia ed in più mi divertivo a creare eventi in collaborazione dello staff televisivo. Tra i miei colleghi c’era Frederick Hawkins, un americano doc, che parlava rigorosamente dialetto romano. Era cosi romano nell’animo che aveva anche la tessera della curva sud. Aveva una grande passione: i sigari! Nei momenti di pausa, leggeva delle riviste patinate che guardava con profonda ammirazione. Curioso come una scimmia, mi mettevo alle sue spalle sbirciando le sue riviste. Erano cigar magazine. Per essere più precisi, Cigar Aficionado. Lentamente mi avvicinai a quel mondo sconosciuto. Andavo in una tabaccheria di via Nizza ad acquistare qualche sigaro. Essendo completamente allo scuro, la scelta cadeva sulla confezione. Acquistavo i sigari in base al packaging. Mi ricordo che fumavo dei sigari dal tubo blu in alluminio. Erano J. Cortes. Mi piaceva la gestualità del sigaro. Il grande amore però nacque una sera ad Ostia, a casa di un altro collega, Armando. Il quale invitò tutto il personale della The Box. Ognuno portava qualcosa. Io mi presentai con un paio di bottiglie di Chianti. Frederick, per gli amici Freddy, con una petaca da 3 di Montecristo n.4. Ci sedemmo in veranda che si affacciava sul lungomare di Ostia. Freddy, Armando ed io accendemmo i puros. In quel preciso istante divenni un Cuban Cigar Aficionado. Di li a poco, le nostre strade si separarono. The Box chiuse i battenti. Armando andò a lavorare per un’altra emittente. Freddy tornò a New York. Ed io entrai nello staff contabile di un famoso studio legale americano. Martedi 11 giugno è stata una reunion. Abbiamo rischiato che degenerasse nella brutta copia di Carramba che Sorpresa. Ma le bestie dormienti site in noi, non hanno tardato a svegliarsi ed a uscire fuori. Dopo pochi minuti erano ripresi i soliti sfottò, come se il tempo non fosse passato. Abbiamo fumato dei canonazos, abbinandoli con un single malt da intenditori, un Highland Park 18YO. Freddy ci ha raccontato le ultime news da New York facendoci notare la differenza di estrazione sociale tra il sindaco di Roma (vecchio e nuovo che sia) e quello della città statunitense. Kastriot invece, leggermente in disparte, si è goduto appieno la fumata cubana. Sono sicuro che il suo pensiero sarà volato alla Isla Grande e alle fantastiche atmosfere che ha vissuto nel suo recente viaggio habanero. Antimo ha conversato come al solito, tirando fuori tutta la sua personalità. E Daniel alla fine si è aggiudicato la bottiglia di Ron Santiago de Cuba, in quanto ha recitato quasi a memoria il mio articolo sulla marca Punch. Io mi sono seduto di fronte ad Armando e Freddy, guardandoli conversare piacevolmente. Per un’ora e mezza sono tornato indietro di quindici anni. Ringrazio tutti i partecipanti alla serata, è stata veramente piacevole. Un saluto particolare a tutto lo staff del bar Jumeirah Grand Hotel Via Veneto che ci ha eletto tavolo preferito e che ci vizia con la sua deliziosa cioccolata. Los Puros del Martes tornerà presto. E, per il momento, stiamo bene cosi. 3 Responses to "“11 giugno 2013„"
Glad to see my brothers across the water having a smoke!